From blood-sucking bed bugs to tunneling gophers, here’s the lowdown on the top five pests to watch out for in 2017 and how Brezden Pest Control can help eliminate them from your home or business. If bats choose to move into your attic or barn, it’s unlikely that they’ll be leaving anytime soon. Bats live in colonies that expand every summer when females give birth. Bats can chew into walls, through wires and damage insulation as well as cause noise disturbances. Around five percent of bats carry rabies, a potentially deadly disease. Their guano (droppings) smells awful and carries the fungus Histoplasma Capsulatam, which can cause a lung infection when inhaled. How Brezden deals with bats: we’ll inspect the property to find out where bats are roosting and safely install bat netting to the entry areas. This special netting allows bats to leave the den at dusk to feed but stops them from re-entering at dawn, so they’re forced to move somewhere else. A week later, Brezden will check and secure the nesting area. These brown insects can grow up to 7mm and are as flat as a piece of paper, which allows them to slip through tiny cracks. Bed bugs are attracted by the warmth and CO2 people give off while sleeping and will feed on humans, sucking up to four times their body weight in blood in just 15 minutes. Just one bed bug can produce 300 eggs in a two-month period and while bites aren’t dangerous, they can cause itchiness, allergic reactions and take a psychological toll on your health. How Brezden deals with bed bugs: an experienced pest control technician will inspect your property thoroughly to find out where the bugs are living before determining the best course of treatment. Bed Bug extermination is notoriously difficult and usually requires chemical or heat treatments and follow-up inspections. A single gopher can produce between 10 and 30 mounds of soil in a month as they dig tunnels through your yard. In the process they’ll chew through tree roots, causing your trees to die of thirst and eat whatever vegetation they find along the way, including grass and bulbs. Each gopher’s burrow can cover as much as 2,000 square feet. How Brezden deals with gophers: in 2016 we launched our new, state-of-the-art Gopher X equipment. The Gopher X machine pushes heated smoke and carbon monoxide into gopher tunnels in a matter of minutes, swiftly and humanely exterminating rodents. Unlike trapping or poisoning, the Gopher X is reliable, fast, and won’t harm your pets or cause damage to your yard. A rat or mouse infestation is one of the most common pest problems we all face. Rodents breed quickly and an entire colony can quickly take up residence in your property, causing smells and noise as well as damage to wiring, furniture and fittings. Most worryingly, rodents may carry a range of diseases such as salmonella, Weil’s disease, Murine Typhus, foot and mouth disease and Brucellosis. How Brezden deals with rodents: we’ll carry out an inspection to find out how and why rodents are entering your property and where they’re living. Brezden uses a mix of live traps, exclusion, snap traps and baits in tamper-proof stations to get rid of rodents. A trained technician will also advise you on how to prevent further infestations and secure your property. In high numbers, birds can become a real nuisance to your property. They may decide to nest in your roof or eaves, causing a lot of noise and mess. The biggest risk of bird infestations is that they leave large amounts of droppings which can breed dangerous diseases. Pigeon droppings in particular have been found to spread encephalitis. How Brezden deals with birds: we use special netting that allows the birds to leave their nest but stops them from being able to re-enter so that they move on to a new nesting location. For pigeons, we use traps and release the birds elsewhere. We never use poison as this can kill larger animals that feed on dead birds and damage the ecosystem. Why Hire Brezden Pest Control in 2017? Experience – Brezden is a family-owned business that has been providing pest control services in the San Luis Obispo area for over three decades. All of our staff are trained and experienced to deal humanely and effectively with any kind of residential or commercial pest problem including insects, rodents, birds and bed bugs. Reputation – we’re proud to have an outstanding reputation for providing reliable and friendly pest control services. Read some of our reviews and testimonials to find out what customers are saying about Brezden’s great service. Eco-friendly solutions – we’re passionate about protecting the environment and we know that many of our customers feel the same way. So, Brezden uses EcoSmart and Mother Earth products that are effective, reasonably-priced and don’t harm the environment. Office locations – Brezden provides pest control services for clients in the following areas: San Luis Obispo, Paso Robles, Shandon, Cayucos, Morro Bay, Templeton, Atascadero, Santa Margarita, Avila Beach, Pismo Beach, Cambria, San Miguel, San Ardo, Whitley Gardens, Los Alamos, Santa Ynez, Solvang, Los Olivos. 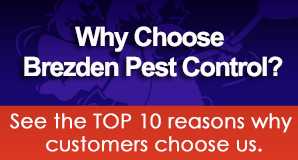 Find out more about why you should hire Brezden Pest Control in 2017 in this guide: Why Customers Choose Us. Get in touch with Brezden Pest Control and we’ll have you pest-free in no time.